ERBzine 0729: Tarzan and the Forbidden City C.H.A.S.E.R. Above is a rare family photograph from Danton Burroughs' personal family collection. John Coleman Burroughs worked closely with his wife Jane Ralston on his ERB art projects. she did much of the printing and background work on his comics illustrations. 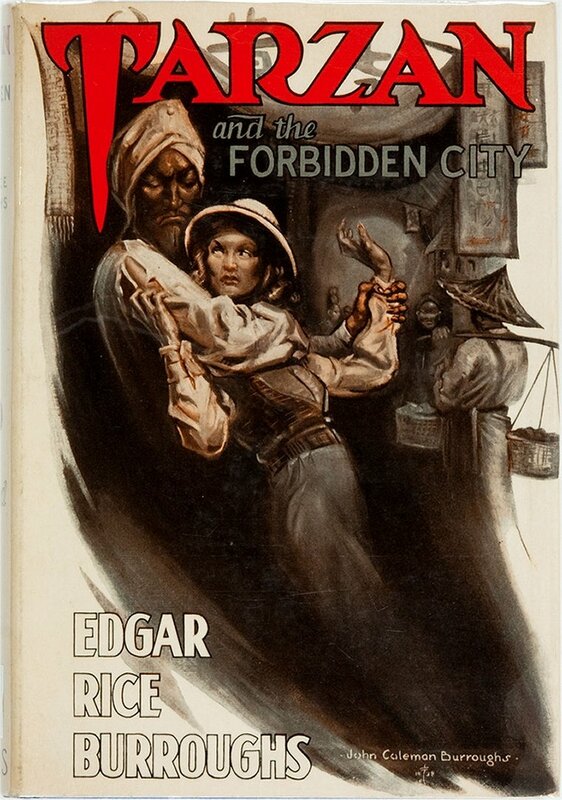 and many other ERB heroines illustrated by her husband. This remarkable photo came out of one of these modeling sessions. 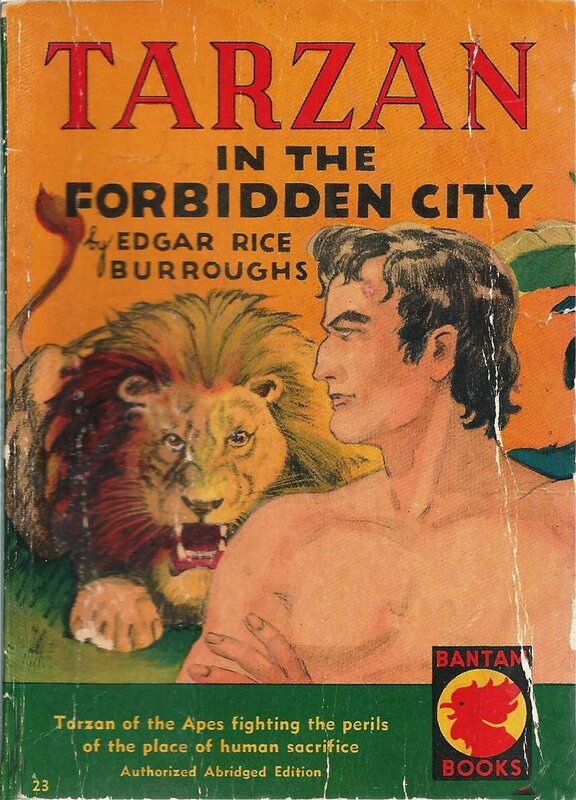 Tarzan and the Forbidden City A young man named Brian Gregory has disappeared in Africa, looking for the fabled Father of Diamonds; his father and sister want to go rescue him, and they can only enlist Tarzan's help because they know Captain Paul D`Arnot. 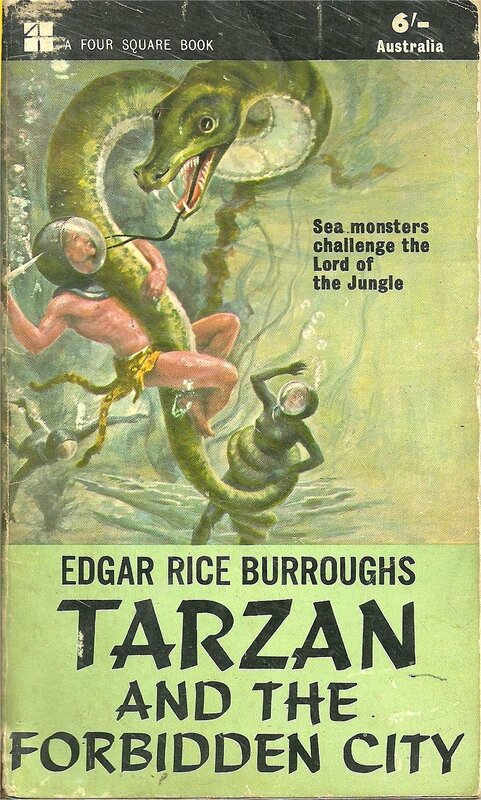 By chance, Tarzan and Brian are lookalike, thus making some vile scoundrels to think Tarzan is Brian. They are also heading out after the big old diamond. 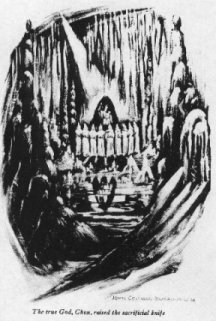 The Forbidden city is again in a secret valley, with two cities Ashair and Thobos in war, because of the Father of Diamonds. 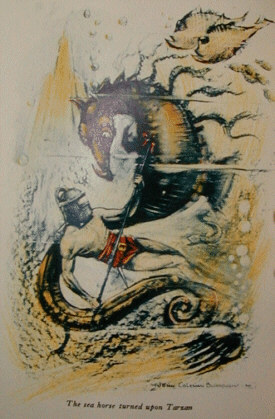 Tarzan has to fight many times against different foes, once even a mansize unicorn seahorse! 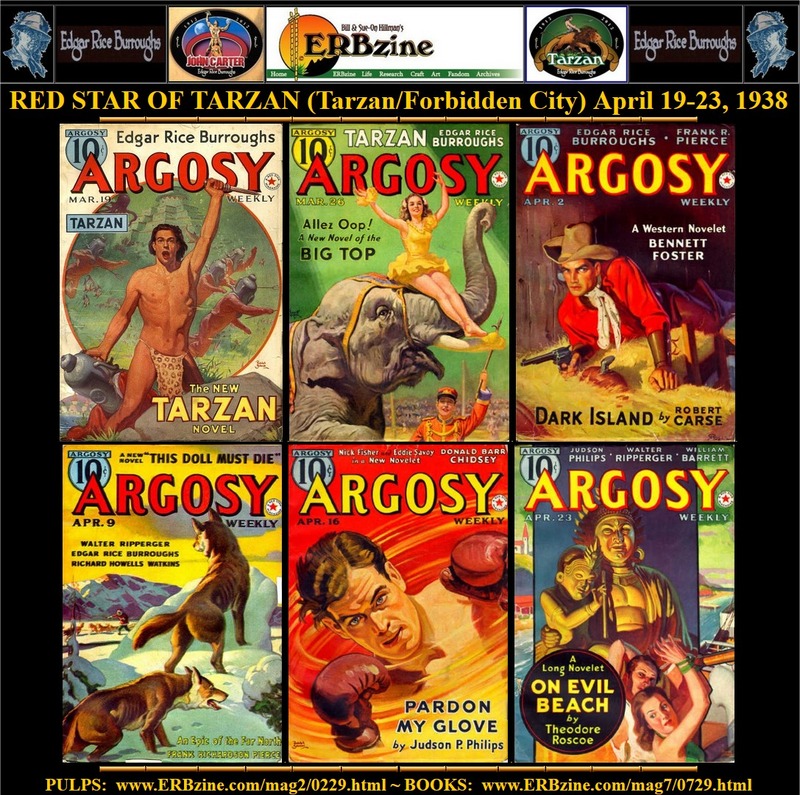 When "The Red Star of Tarzan" appeared in Argosy magazine in 1938, it caused a minor stir among Burroughs fans. 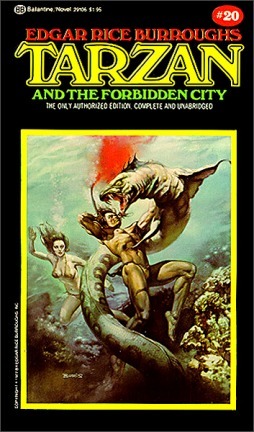 Some thought that ERB was not the author of the story. 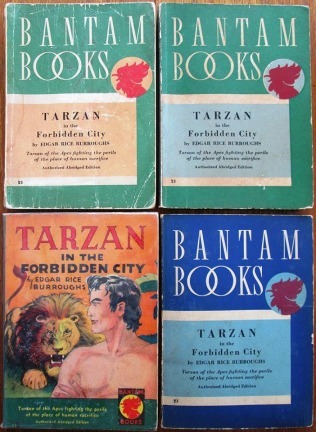 Later, in September, 1938, when the book version, Tarzan and the Forbidden City, was published, fans noted a great difference between the book version and the magazine version, both in style and story. Burroughs Bibliophile Paul Spencer points out these variations in his article entitled "The Mystery of the Red Star of Tarzan." With the publication of the book, I simply filed it in my mind as a genuine Burroughs product, and the magazine's version as the tampering of Argosy's editor. 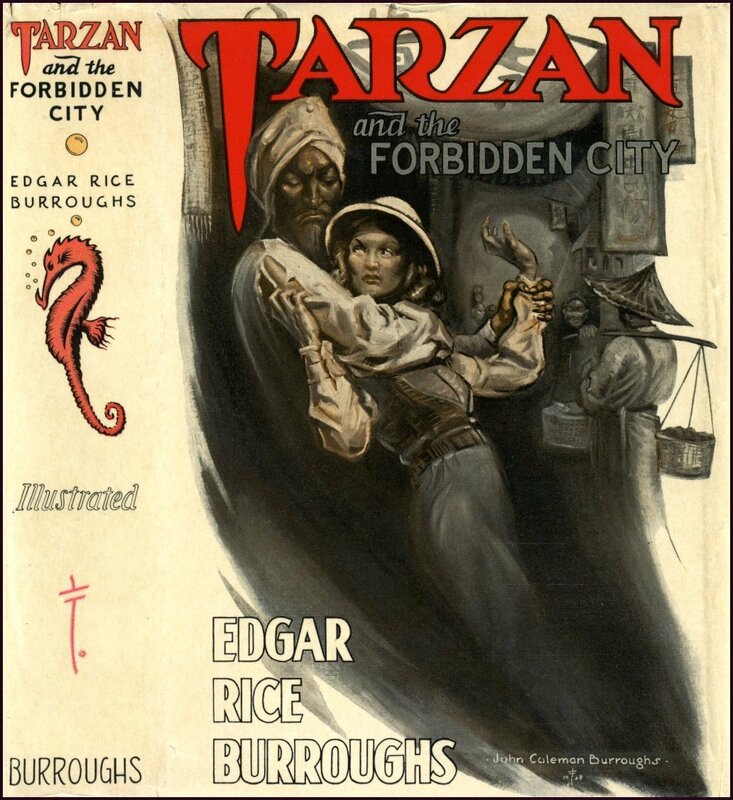 The original version of this story was produced as a radio serial drama entitled "Tarzan and the Diamond of Asher." 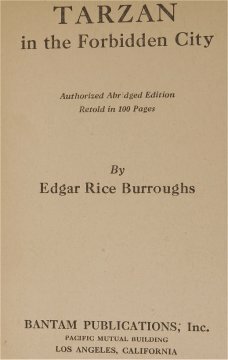 ERB makes no mention of the radio drama in his working notebook, but he does mention starting the book on October 10, 1937 and finishing it on November 18, 1937. 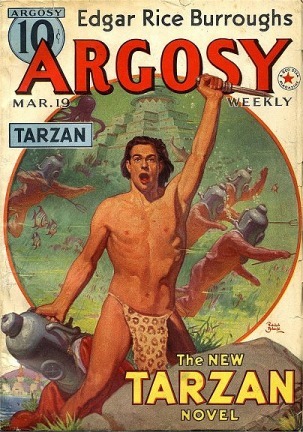 It was accepted by the editor of Argosy and published with considerable rewriting by someone at the magazine office, under the title of "The Red Star of Tarzan." 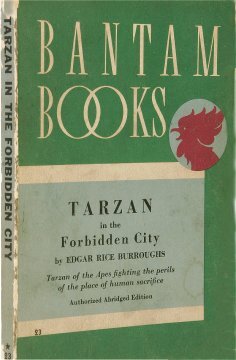 When ERB published it in book form in 1938, he published it as he had originally written it in 1937 under its original title, Tarzan and the Forbidden City. Why "Red Star?" 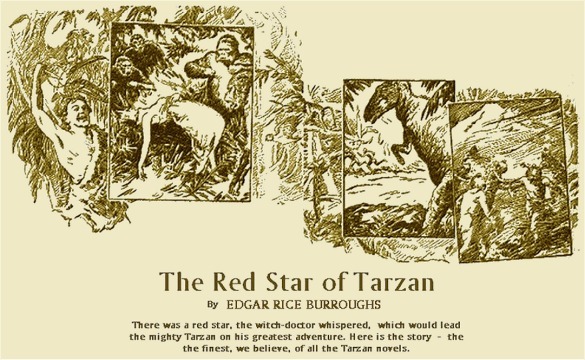 Upon reading the prologue of the Argosy version (not in the book version) (see below), you will find that a witch-doctor mentions Tarzan and "the red star" which would lead him to a world long dead. Also, the fact that the Munsey line of magazines were at that time referred to as "Red Star" magazines, ay or may not have been a coincidence. Whatever the mystery of the Red Star may prove to be, we offer this story here, exactly as published by Argosy 36 years ago, for the entertainment of the Burroughs Bibliophiles. 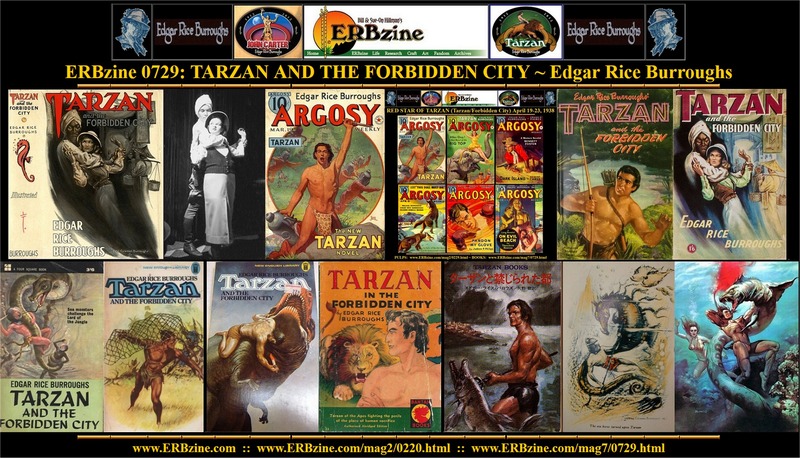 "Tarzan and the Diamond of Asher"
and the final novel version published by ERB, Inc.
WEEK 12 WEEK 13 . . The season of the rains had passed and the tropic sun ruled the waking hours, fire-bright. The jungle was alive with growing green, and Usha, the wind, breathed softly through the fragrance of myriad exotic blooms. On this day, newly born, the afterdawn was clean and cool. A hunter of the Ngombo tribe, lean and brush-haired, crept to the edge of a grassy clearing. HIs eyes were alert, his spear poised. Ahead was a waterhole where zebra and antelope drank, meat for the cook fires of his village. But suddenly the stalker halted. He squatted low in quick concealment and fear chased surprise across his claw-scarred face. His spear-hand shook as he parted the grasses to peer again. ONce more he saw that strange sight and it ws real. He had not dreamed it. There at the spreading pool a vast gray bulk disported. Giant of giants, king bull of the herds, Tantor the elephant was frolicking in the green water. With squeals and trumpetings of pleasure he splashed about. Now he sent a spray from his trunk to douse the figure that swam beside his trunk. This second figure gave forth a shout. And it was indeed a man, the Ngombo hunter saw now. A white devil, tall and lithe and strong. He emerged from the pool and pushed back long straight hair. Like a dog he shook himself. He spoke to Tantor in a strange tongue, and the elephant grumbled in answer. The watching native did not move while the white devil dried in the sun. He saw the stranger don a breech clout of soft leopard skin. There wa a stout bow and a quiver of arrows with a long-bladed knife beside them. The white devil reached for the knife, then turned to face the wind, sniffing. H called out in a queer chatter. From the trees at the clearing's edge came chattering answer. There was a rustling among the branches and brown shapes dropped to earth. The white devil ate the fruit that the monkeys brought him. A deeper fear bit into the Ngombo warrior then. Silent as a snake he crawled away, and the distance to his village was covered at a run. He sought out the witch-doctor and told his tale. "This white devil has put a juju upon the jungle beasts," he panted. "He will weave enchantment upon our village and our women and treasures will be his to take. Here, Okoola are hides and a knife and a glass that shines. I give them to you as a price of a spell against him." He held forth his gifts, humbly. The witch-doctor was old and snag-toothed and wise. He did not believe such a fool's tale bu t he carried the gifts to his hut and donned the mask and robe that he ceremony demanded. He built a fire of twigs and grass and spoke the incantation while the hunter squatted across the flame from him. Then he brought forth the dried herbs and the powdered bone, the hair of ape and skin of snake, and the warrior's arm gave blood to season them in a bowl. He weaved his fingers through the flame, then emptied the bowl upon it. A green fire flickered, and smoke rose up, both black and gray. And when the billows and eddies of smoke had thinned and vanished the witch-doctor spoke. His face was grayed beneath the juju paint and his skinny hand pushed hard against his heart. "Zemballa!" he intoned. "So it is decreed." "There is a spell and a power greater than mine," wheezed the old conjure man, "that holds the white devil. He is not ours to fear. . . . "
The Ngombo hunter touched his lips with a sign and bent his head to earth. "He was big in the smoke," the witch-doctor said, "and red was the danger star behind him. The black of death was there. His legs spanned three worlds we will never see. In the belly of a bird he will fly, into the earth he will worm and fish will call him brother in a green deep." Slowly he spoke, with wheezing breath and his eyes blindly glazed. And he did not know whence came the words in his mouth. "The red star will lead him to a world long dead and forgotten. He will rule a kingdom yet unborn. In his hands he will hold the Father of Diamonds, with war grim about him, and know that his smallest peril is still the deadliest." "Zemballa!" cried the cringing hunter. The witch-doctor's body jerked and stiffened. A bubbly froth flecked his lips with white. "The fire-star--" he moaned. "Beware the woman's lips and the beast that flies." With a whimper he collapsed. He lay like an ugly broken doll while the hunter ran from the hut howling. 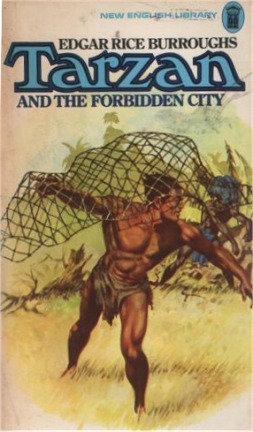 Tarzan had traveled fast and far. . . .
Arthur Gregory, American millionaire, has come to Africa to seek the whereabouts of his son, Brian, who embarked on a secret expedition and has since been among the missing. It is supposed that Brian Gregory has been seeking to find Ashair, the Forbidden City, and bring back the fabulous Father of Diamonds. Assigned by the French government to assist Gregory is Captain Paul d'Arnot. On the trip to the interior, where the safari waits, d'Arnot has spent much time in the company of Gregory's daughter, Helen and has fallen in love with the girl. The same river boat to the interior has as passenger one Atan Thome, a fat Eurasian who once accompanied an unsuccessful expedition that sought to find Ashair. Thome learns that Gregory has a route map to the place, drawn up by his son. He manages to steal the map -- and also to bribe the leader of the safari for which Gregory has arranged. With Gregory's bearers and equipment he heads out. D'Arnot, however, believes they can overtake the thief. 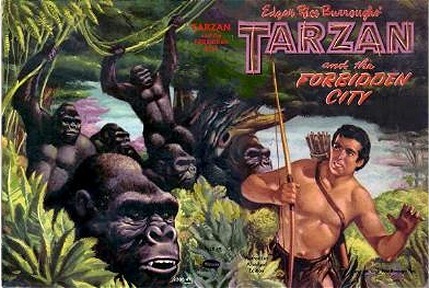 The captain is an old friend of Tarzan of the Apes, and at his request Tarzan agrees to help the Gregory party. Through his government, d'Arnot arranges for a Navy plane to be placed at their disposal. The pilot of the plane is a certain Lieutenant Lavac. Also attached to the party is a mysterious woman, Magra, who claims that Brian Gregory is betrothed to her. The plane starts in pursuit. As a result of a tropic storm they are driven from the course and lost above the jungle. As they drop down for an emergency landing on a little lake a mammoth creature flies at them on lumbering wings. Lavac brings them down in a semi-crash. Meanwhile, Atan Thome and his bearded servant Lal Taask are also having their difficulties. As they approach closer and closer to Tuen-aka, the mountain that marks the region of Ashair, their native porters become increasingly alarmed. They complain that this place is evil, Great beasts from another age prowl in this country, and moreover there are spirits who steal a man's soul away. Thome lashes them on, however, -- and awakes one midnight to find they have deserted him. 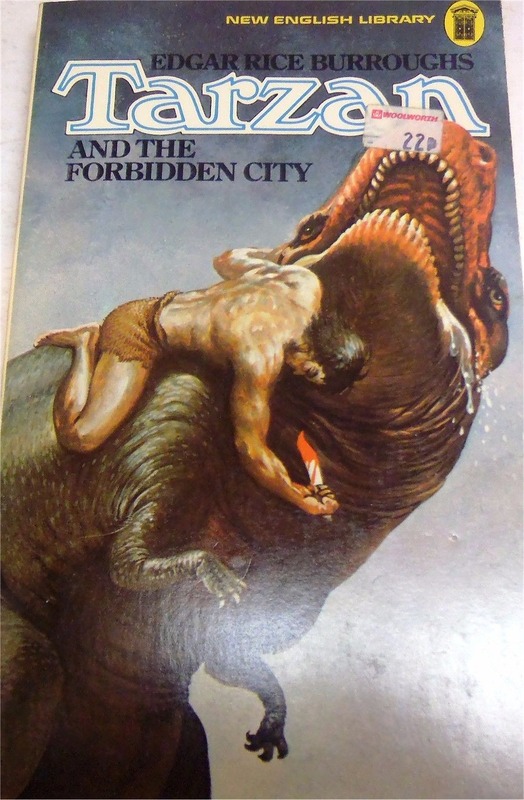 Even as he makes the discovery he is thrown into panic by the appearance of a hissing monster like a dinosaur. The Gregory party manages to save some equipment from the wrecked plane. They erect temporary shelters and attempt to make the best of it. 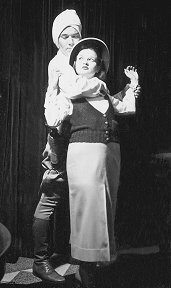 In a n attack by prowling natives, though, Helen Gregory is carried away. Tarzan sets out in the dark to find her, guided by the sound of the torture drums. Brian Gregory, young American explorer, came to Africa to search for that fabulous stone known as the Father of Diamonds. Somewhere in the jungle depths all trace of him has been lost. It was known that he was seeking to find Ashair, the Forbidden City -- the stronghold of a strange white race that guards its secrets zealously. Gregory's father has financed an expedition to discover the fate of his son. Accompanying the party is CAptain Paul d'Arnot of the French Navy who has fallen deeply in love with Gregory's lovely daughter, Helen. Through d'Arnot's influence they have secured the aid of the man who knows AFrica better than any other -- Tarzan of the Apes. By a curious chain of circumstances, the expedition finds itself near the goal they have been seeking. MOst of their equipment has been lost, but Tarzan leads them through the wilds. In the distant sky he has seen the strange red glow that is said to mark Tuen-Baka, extinct volcano that houses Ashair. Meanwhile, a rival expedition has also been seeking the Forbidden City. This is a two-man safari, consisting of the fat and sly Eurasian Atan Thome, and his bearded servant, Lal Taask. This pair of rascals had reached Tuen-Bakla when they were deserted by their bearers. They attempted the dangerous cliff passage to the interior and were captured by a galley-load of the strangely garbed warriors of Ashair. Spears prod them into the presence of Atka the exotic queen of the tribe. They buy temporary freedom by informing her that another expedition is coming to capture the city, telling tall tales as to the prowess of Tarzan and his companions. The queen orders, Akamen, her chief noble, to see to the capture of these strangers. 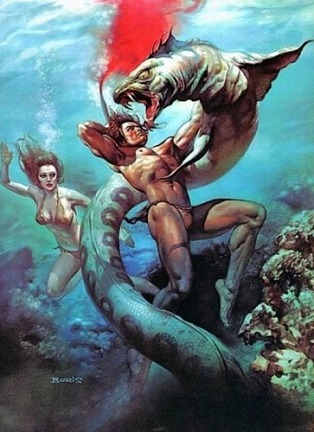 Tarzan, scouting the slopes of Tuen-Baka ahead of the others, has come upon a warrior about to be destroyed by a queer hissing creature from the prehistoric. He rescues the man, and learns that he is Thetan, nephew to King Herat of Tobos. Within the great bowl of Tuen-Baka, it appears, there is a lake that conceals many mysteries in its depths. From many years the rival cities of Thobos and Ashair have been warring for supremacy here. 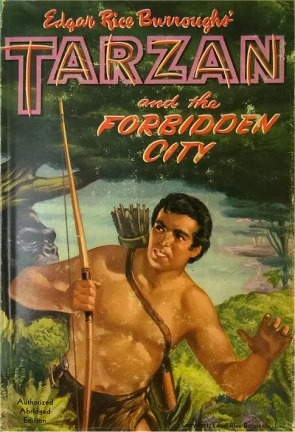 All strangers are forbidden to approach under penalty of death, yet Thetan agrees to assist Tarzan and his party to whatever extent he is able. Deep in the wild heart of Africa lies Tuen-Baka, towering shell of what was once a smoldering Volcano. Here strange prehistoric creatures have lived on and a queer civilization has persisted. A great lake now fills the bottom of the volcano, and at either end of the lake cities have risen. ONe of these is Ashair, ruled by Queen Atka whose cruelties have earned her the name of "devil's daughter." The other is Thobos where King Herat holds sway. For many years warfare has raged between them. Into this strange land comes Tarzan of the Apes, heading an expedition of disaster. Some years ago, a young American explorer had disappeared while in search of Ashair and the fabulous Father of Diamonds. IN the part of the ape-man are Arthur Gregory, father of the explorer, and lovely Helen Gregory, his sister; also Captain Paul d'Arnot. 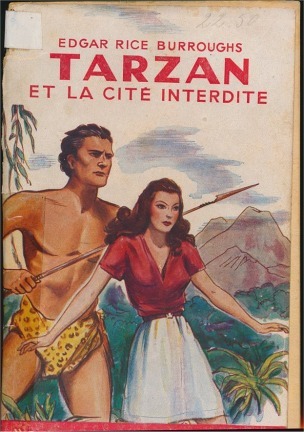 Tarzan's friend who is in love wit Helen, and one Lieutenant Lavac, of the French Navy. A mysterious woman who calls herself Magra has also accompanied them, on the pretext that she is Brian Gregory's financee. After many unusual adventures the party reached its goal, but they are without equipment, arms or ammunition. They cannot go back -- they fear to push forward. 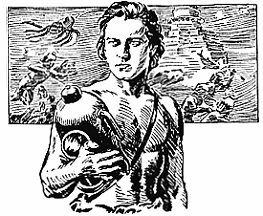 Tarzan, however, has made friends with a young warrior of Thobos whom he rescued from death, and the two of them capture an Asharian galley that patrols the outer river. Aboard this craft the expedition rides the tunnel entrance to the inner lake, where disaster again strikes. They are attacked by a powerful force of Asharians and their galley wrecked. 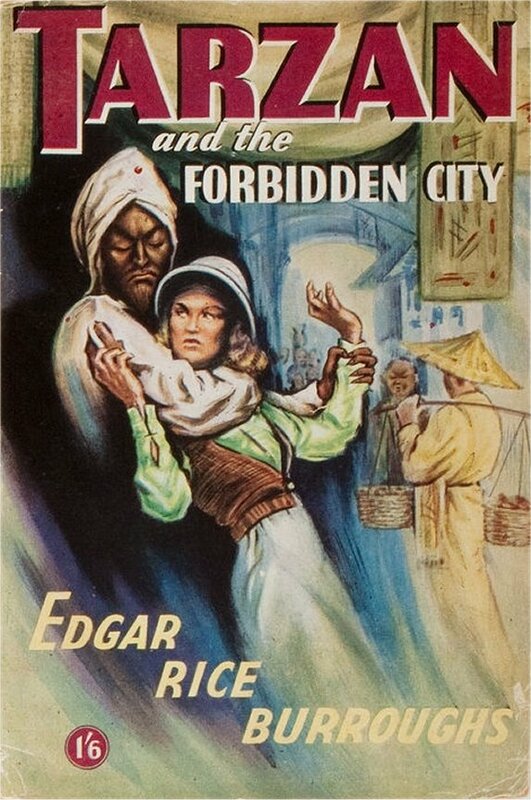 Captain d'Arnot and Helen are captured by the foe and taken to the Forbidden City. 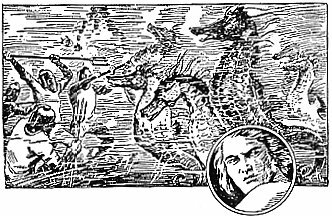 Tarzan, together with Gregory, Lavac and Magra find temporary safety ashore. Thetan, the young Thoboitian warrior, has agreed to lead them to his city and plead in their behalf before King Herat, his uncle. Meanwhile, added to the plot and counterplot are the activities of the fat Eurasian, Atan Thome. This sly rascal has set his heart upon obtaining the Father of Diamonds, and has endured tremendously to reach Ashair. With his bearded servant, Lal Taask, he is accepted on sufferance at Atka's palace. Already he is plotting with Akamen, chief noble of the court, to murder the haughty queen. Brian Gregory, young American explorer, has been lost in the African jungle while searching for Ashair, the Forbidden City and for that fabulous stone, the Father of Diamonds. Gregory's father has set out on a rescue expedition, accompanied by Captain Paul d'Arnot and Gregory's daughter, Helen, with whom d'Arnot has fallen deeply in love. 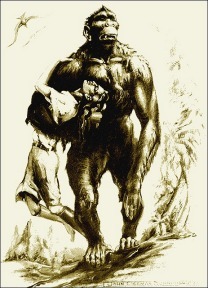 And leading them is an old friend of d'Arnot's, the man who knows Africa better than any other -- Tarzan of the Apes. At last they near their goal which is Tuen-Baka, an extinct volcano that houses Ashair. Meanwhile a two-man safari has also been seeking the Forbidden City, the sly Eurasian Atan Thome and his servant Lal Taask. Near Ashair they are captured and brought before Atka, the exotic Asharian queen. When Thome tells her of Tarzan's approaching expedition, she gives the two men temporary freedom. The Eurasian manages to win the confidence of Akamen, a great noble of the tribe, and they whisper of a plot to kill Queen Atka so that Akamen may rule. The Gregory expedition which is accompanied now by a warrior from Thobos, the city hostile to Ashair is menaced by Asharian warriors. 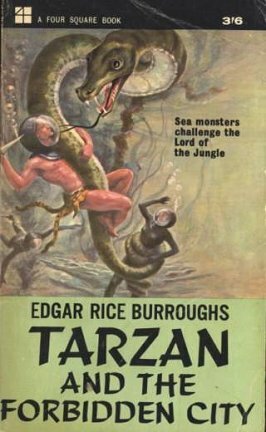 Aided by a tribe of great apes, Tarzan captures a galley from Ashair and in it the party heads for Lake Horus which surrounds the Forbidden City. But they are met by one of Queen Atka's warrior galleys, overcome, and Helen and d'Arnot are captured. 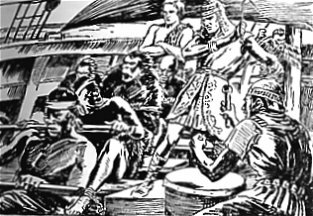 Thetan, Tarzan's friend leads the remainder of the Gregory party to Thobos where his uncle Herat is king. The raven-haired Queen Atka condemns d'Arnot to the cages of the temple of Brulor and Helen to serve as handmaiden to the priests. Deep under Lake Horus lies this temple, constructed over an air-shaft. There the old man Brulor guards the Father of Diamonds and there d'Arnot is imprisoned -- next to the cage of Brian Gregory. Escape seems hopeless. But Helen Gregory strikes down the priest whom she is to serve, and frees her brother and d'Arnot. They let out the other prisoners, and guided by Herkuf, an unfrocked priest, they flee through a tunnel that leads under the lake. Their escape is discovered when Lal Taask, Atan Thome and Akamen are brought ot the cages, condemned because they have attempted to murder Queen Atka. 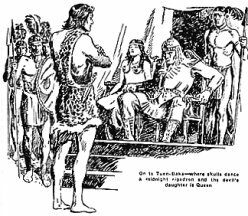 In Thobos King Herat agrees to liberate Tarzan and his companions on three conditions. Tarzan fulfills the first two by slaying a giant Asharian warrior, and a half-beast half-man called the Mogro-Mu. Then he sets out on the third test which is to bring King Herat the Father of Diamonds from Ashair. In the jungle he comes upon Helen, d'Arnot and the other prisoners; they have just been seized by a band of Asharian spearmen. Tarzan rescues them and eventually the whole party turn their faces toward the Forbidden City. 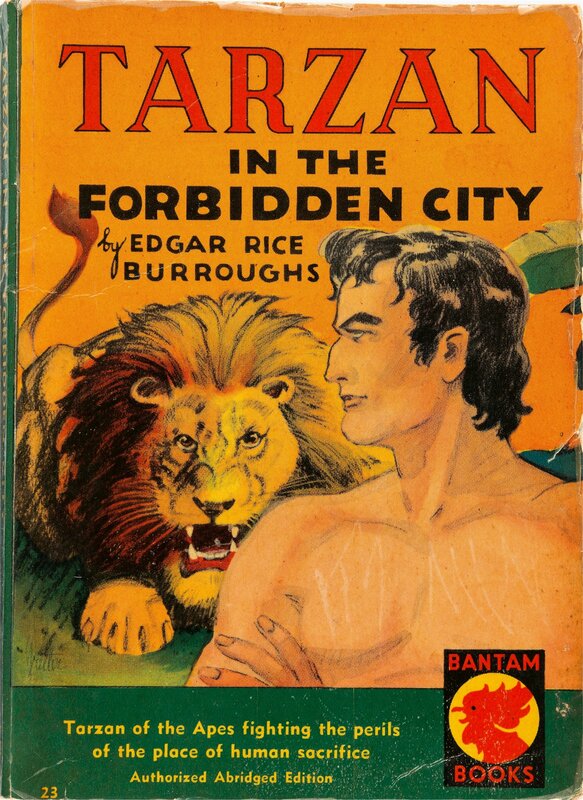 Copyright 1938, by Edgar Rice Burroughs, Inc.
Tarzan cared little for the fate of adventurer Brian Gregory, drawn to the legendary city of Ashair by the rumor of the Father of Diamonds, the world's hugest gem. But to the ape-man the tie of friendship was unbreakable, and Paul d'Arnot's pleas moved him to agree to guide the expedition Gregory's father and sister organized for his rescue. The enigmatic Atan Thome was also obsessed with the Father of Diamonds, and planted agents in the Gregory safari to spy out its route and sabotage its efforts. Both parties reached their goal, remote Ashair...as prisoners of its priests, doomed to die in loathsome rites. There were still ninety pages to go. The book blurred through the air and smacked hard against a closet door and I grumbled as I went to bring it back. TARZAN AND THE FORBIDDEN CITY isn`t unbearably awful in itself, it`s just leftover turkey warmed up the third day after Thanksgiving. Well, the final result is pretty lame. There is not much of Burroughs' distinctive style in the writing, and almost no bitter sermons about how awful human beings are. On the other hand, there are none of those unexpected moments of great inventiveness that marked his work, either. There is a large unwieldy cast, about half of which get killed off without really contributing much. Basically, the cause of all the commotion is something called the Father of Diamonds, a treasure held in a remote valley named Tuen-Baka. As seems inevitable, there are two cities here, Ashair and Thobos, which have been at war with each other for generations (something about Africa forces people to establish pairs of feuding settlements, I guess). We never find out where these people came from, but the mention of Isis and Horus probably means they were an Egyptian colony. At some point, Africa must have been filled with different expeditions from Greece, Israel, Egypt, the Crusaders, Atlantis, Crete, Phoenicia... all busily setting up pairs of cities to fight with each other. 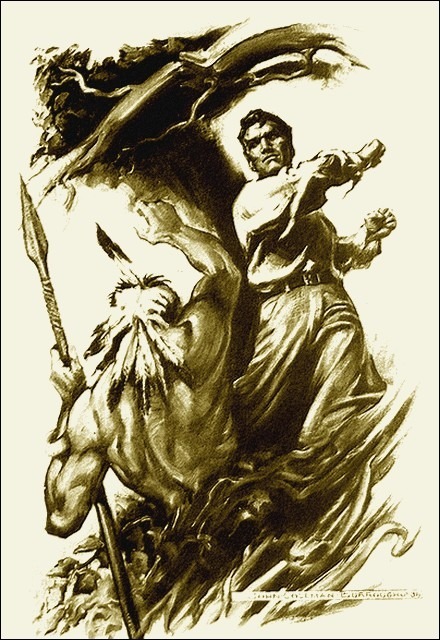 I`m surprised there wasn`t a Viking settlement in a Tarzan story. 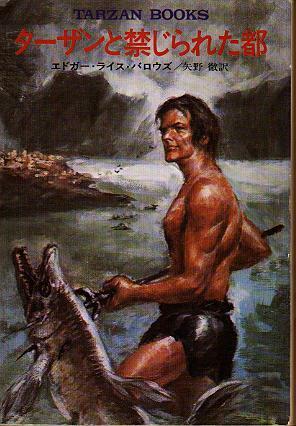 A young man named Brian Gregory has disappeared into the wilderness, looking for the fabled Father of Diamonds; his father and sister want to go rescue him, and they can only enlist Tarzan`s help because they know Captain Paul D`Arnot of the French navy. 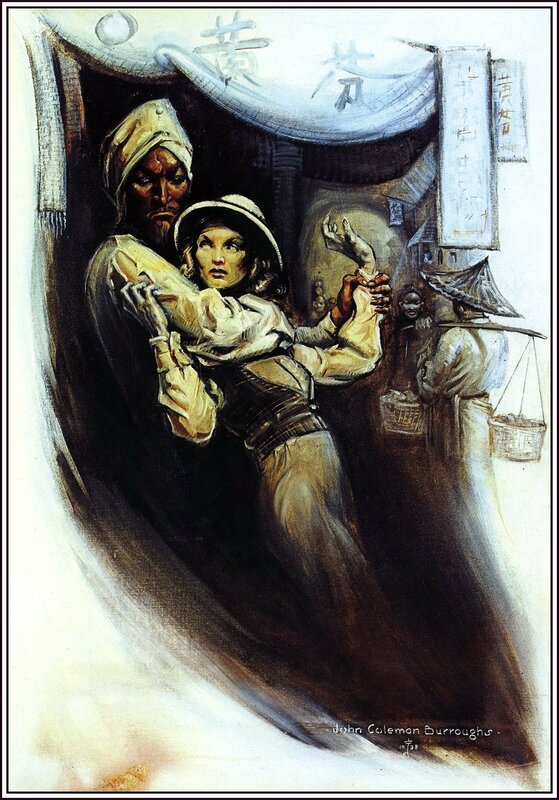 (D`Arnot is smitten with Helen Gregory, who at nineteen has got to be less than half his age, but oh well....) D`Arnot is one of the few humans Tarzan likes (a holdover from his origin story), so he agrees to lead the expedition. At the same time, some vile scoundrels are also heading out after the big old diamond, and the hunter hired to guide the Gregorys´ safari is a murderous crook who hates "that monkey-man". The hunter is lustful for a beautiful femme fatale who fancies Tarzan, so you can see how there is likely to be plenty of trouble before they even get anywhere near the Forbidden City. I`m a little surprised to see that the Great Apes are out looking for a victim to sacrifice in their ceremonial Dum-dum. They grab poor Helen (born to be abducted, that`s her) specifically for the purpose of later tearing her to bits after the dance. Say, Edgar, what was all the stuff you said about men being the only creatures who killed except for food or self-defense? Mention it to these apes. Yet, despite all the slaughter and arguing and people chasing each other back and forth, the story never comes to life on the page. Burroughs obviously didn`t want to write this book and put little energy into it. Paul D`Arnot, the man who was Tarzan`s first human friend way back in TARZAN OF THE APES and who set him up in Paris for some interesting times, just idles through the story. 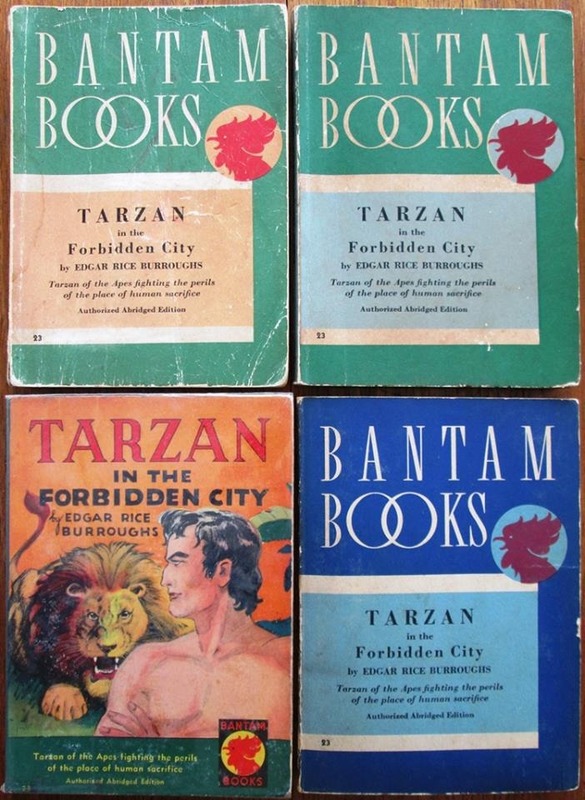 He sweet-talks Helen Gregory, remarks every few pages how wonderful Tarzan is, and that`s about it. Some conversation between the two old chums, a little character development, would have given this story some heart it badly needs. In the previous book, Jane made a much welcome comeback, bringing a spark of vitality and genuine emotion to the action. 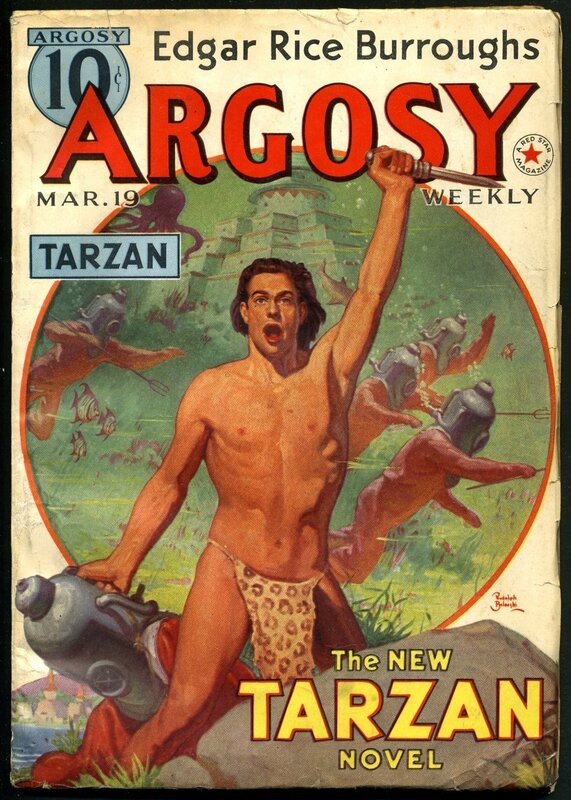 (This was TARZAN`S QUEST, which ended with those longevity pills being distributed to everyone.) 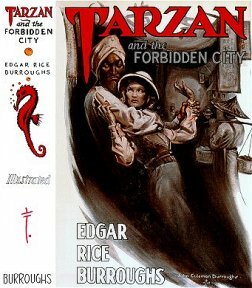 Not only is Jane completely absent again (as is N`Kima), Tarzan is not once referred to as John Clayton or Lord Greystoke in this book. There is one brief explanation that he had been "raised by beasts among beasts" and that`s it. 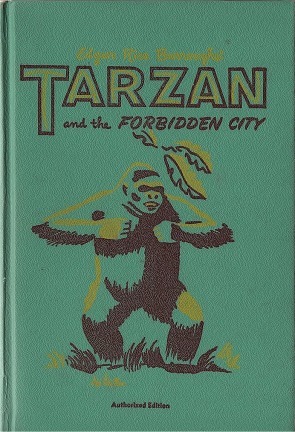 The Tarzan of this book is a simplified version with none of the inner conflicts which made him so interesting before. 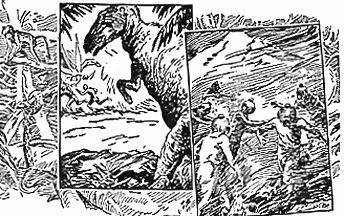 At one point, the Apeman rescues a warrior from a rather small Tyrannaosaur (about the size of a bull) but no more dinosaurs appear and the incident is not thought worth discussing later. Then, while wearing diving suits, our hero and his friends are attacked by (wait for it) vicious giant sea horses which have horns on their snouts. (?!) Sea unicorns, maybe? And the final punchline, where the much coveted Father of Diamonds turns out to be a chunk of coal, wins the "Oh, Come ON!" for the year. Yes, we know today diamonds are made from coal deep inside the Earth, and yes, it`s so terribly ironic. But how did the people of Ashair know this? It`s like having Plato remark how interesting the Red Spot on Jupiter is... the information just wasn`t available. 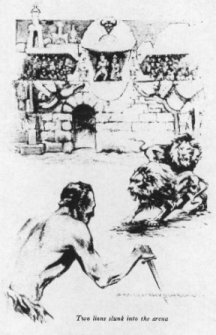 *Actually, it has become so monotonous having Tarzan kill a lion with a knife that this time he must face TWO of them at once to make it interesting. His elegant solution is to simply haul one lion up overhead (that`s about four hundred pounds of wriggling big cat there) and throw it at the other one. 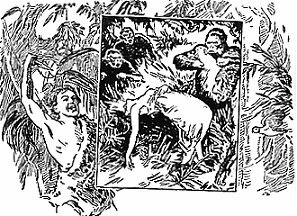 After the two beasts fight, the Apeman can simply stab the survivor, which at this point seems about as risky for him as shooing a cat off the couch. 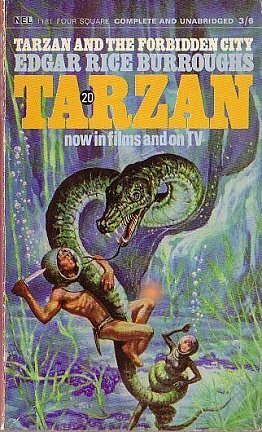 In addition to the three lions he dispatches, Tarzan also stabs to death a shark and a sea serpent, never getting a single bruise or scratch from these tangles. At some point, I almost expect him to start carrying on a conversation while wrestling with a lion. Larger Bantam 1 :: Larger Bantam 2 .